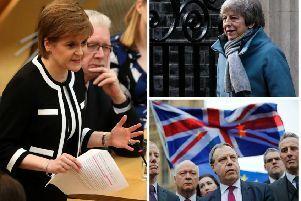 Senior SNP figures have joined calls for First Minister Nicola Sturgeon to relax her grip on the party and rethink its stance on a second indep­endence referendum in the wake of its election losses. Former rural affairs secretary Richard Lochhead called on his party to “show we’re listening” after the SNP lost 21 MPs last week. And Kenny Macaskill, the former justice secretary, called on Ms Sturgeon’s husband, Peter Murrell, to stand down as SNP chief executive. The First Minister has promised to “reflect carefully” on the election result ahead of a possible climbdown over another independence referendum. But there have been widespread calls from within her own party to overhaul its structures and decentralise power. Insiders have claimed that key decisions are taken by Ms Sturgeon and Mr Murrell with little consultation. Mr Macaskill called on the SNP leadership to broaden the party’s management team. Mr Lochhead is MSP for Moray, where the SNP deputy leader Angus Robertson was defeated by the Conservatives. The pair joined another former SNP frontbencher, Alex Neil, who yesterday said a second independence referendum should be put on hold until the Nationalists could be sure of victory. “The presumption underlying the commitment to a referendum was that there would be a backlash against Brexit and it would persuade a lot of people to change their minds in favour of independence,” Mr Neil said. Labour’s general election campaign manager, James Kelly, MSP, said: “It’s quite clear that Nicola Sturgeon’s woeful record in government cost the SNP seats in this election. And questions will rightly be asked within the SNP about the panicked campaign that Peter Murrell helped to run, which culminated in the farcical attempt to tell voters to back the SNP to get Labour. It was confused, incompetent and desperate.